Keith Williams Architects working with Buro Happold has been shortlisted to design the new €32 million Bochum Musikzentrum, near Dusseldorf, Germany. 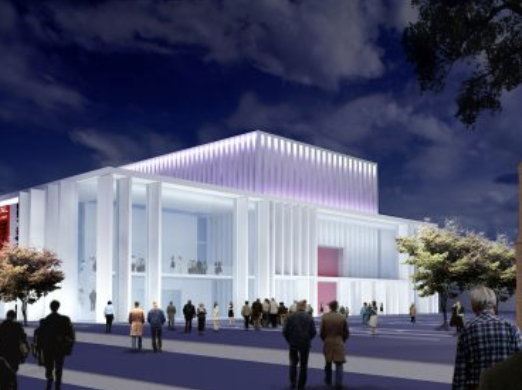 The new cultural building will house a 1,000 seat concert hall and a 250 seat multipurpose hall for the Bochum Symphony Orchestra. The project extends the basic concert hall brief to allow the building to operate at a civic level enabling the completion of this fractured piece of city by creating a new square separating the Musikzentrum and the Marienkirche, thereby uniting key aspects of the fragmented post-war city plan. The 5,000m2 project is located in the centre of Bochum and is part of a wider master plan for regeneration of the city quarter, ”Kreativquartier Viktoria Quartier Bochum” to create a newly defined city space and a new set piece of important cityscape centred on the new Bochum Musikzentrum (Concert Hall) and the Marienkirche (19th century church), the latter being restored and extended during the 1950s, after the wartime bombing. The currently vacant 19th Century Marien-Church located on the site is to be preserved and will form an integral part of the overall scheme. Keith Williams Architects and Euro Happold will submit their proposals on 4 May.